So while I didn't purchase much this past month I sure seem to have gone through a lot of things. Lush - Honey I Washed My Hair - Shampoo Bar - This smells just like the soap, Honey I Washed The Kids. This has taken me a while to get through and to be honest the shampoo bars annoy me, I think if my hair was shoulder length or shorter then it would be fine but with my long hair it just gets tangled. Lush - Lord Of Misrule - Bath Bomb - I think this is my second favourite bath bomb, it is quite heady, hippy and very much patchouli scented [full review]. 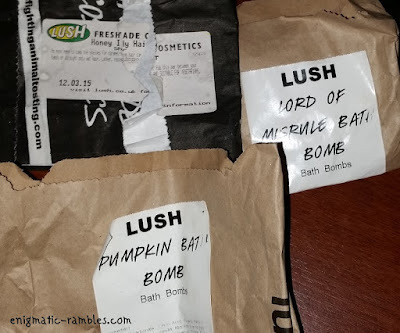 Lush - Pumpkin Bath Bomb - A novelty but not one I would purchase again [full review]. Ciate - Glass Slipper - This was nice enough but as I don't us glitters it dried up and I won't be buying it again [swatch]. Models Own - True Blue - This is a great straight up blue cream polish, I wouldn't repurchase it as I have plenty of blues which I prefer more to this Models Own one [swatch]. W7 - Blue Dazzle - This dried up so was time to bin, I don't use glitter all that much so won't be repurchasing [swatch]. Leighton Denny - Slick Tips - Again this is something I liked to use up, not something I would repurchase as it is quite expensive. Scented of lemongrass. Gelous - This can be used as a ridge filling base coat or as a topcoat for a glitter, it is quite thick which helps to even out that gritty texture you can get from a glitter polish. I did like this. [full review]. Hits Dionisio - A gorgeous purple holographic polish, I really liked this one [swatch]. TRESemmé Keratin Smooth - Shampoo - I like this shampoo, it makes me have to do even less with my hair than I would if I used a volumising shampoo. It helps my straight hair stay straight without having to use another product or to straighten it. Clearly I am very lazy when it comes to my hair! 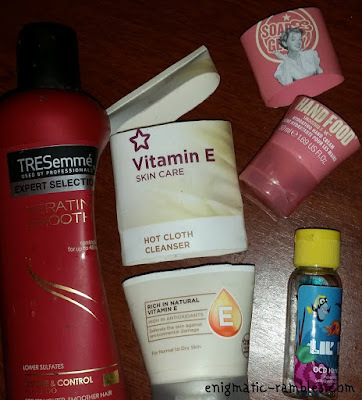 Vitamin E - Hot Cloth Cleanser - Adore this, definitely my go to make up removing product of choice [full review]. Soap and Glory - Hand Food - This one was Smoothie Star I think which smells like digestive biscuits. Quite a thick hand lotion but it does sink in quite quickly and I would repurchase this one. Yankee Candle - Wax Tart - Rain Washed Berry - I have no idea what a 'rain washed berry' is supposed to smell like but this had quite a good scent throw and smelt of strawberries, vague cherries and citrus. Yankee Candle - Wax Tart - Witches Brew - Has a strong scent of patchouli to it which I really like. 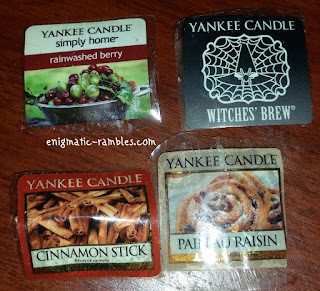 Yankee Candle - Wax Tart - Cinnamon Stick - Quite a good scent throw to it, very seasonal. Yankee Candle - Wax Tart - Pain Au Raisin - I didn't find this one had much of a smell to it at all which was disappointing. Yankee Candle - Salted Caramel - Large Jar - A very sweet smelling candle, not sure I would describe it as salted caramel but caramel was there. 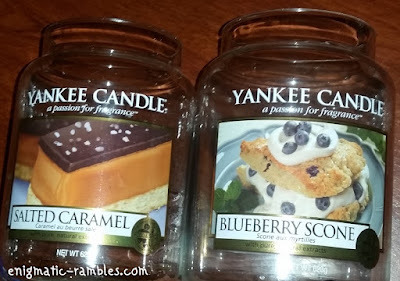 Yankee Candle - Blueberry Scone - Large Jar - Again I am not sure this smells of what is says it does, there was a scent of baking something sweet though which was nice.